After the success of their 2014 event, Architects for Animals has been at it again! 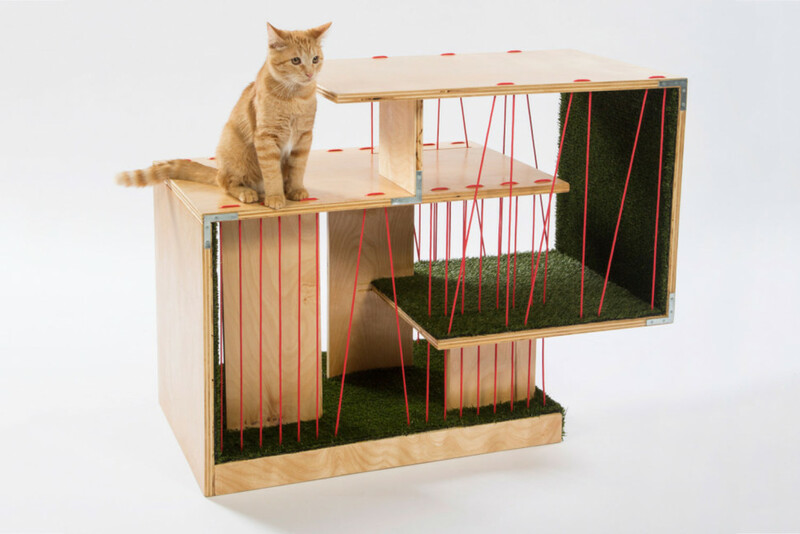 Designed to raise awareness of Los Angeles’ stray cat population, the project recruited twelve highbrow architects to build one-of-a-kind cat houses. The kitty condos each sold at auction with all proceeds benefiting the spay and neuter organization, FixNation. On March 10th, 2016, each of the twelve architects saw their creations sell at the “Giving Shelter” exhibit at the Herman Miller showroom in Los Angeles. The most loved of all twelve feline abodes? A large bowl made from thick layers of wood and constructed by Abramson Teiger Architects. In addition to Abramson Teiger, other participating architectural companies in the project include Perkins + Will, HOK, DSH Architecture, Lehrer Architects, Standard Architecture, KnowHow Shop, Formation Association, Pfeiffer Partners Architects, RNL Design, WORD and Schmidt Designs, and CallisonRTKL. The “cat bowl” (mentioned above) drew crowd attention for its unique and playful design. Multiple portals provide easy escape and entry points and the faux grass patio on top offers a spot for sunning. While the close stacked wooden layers provide some protection, however, the larger openings may limit the ability to keep out the wind and rain. Despite this, the “cat bowl” still provides safety from predators and offers cat-lovers an aesthetically unique centerpiece. 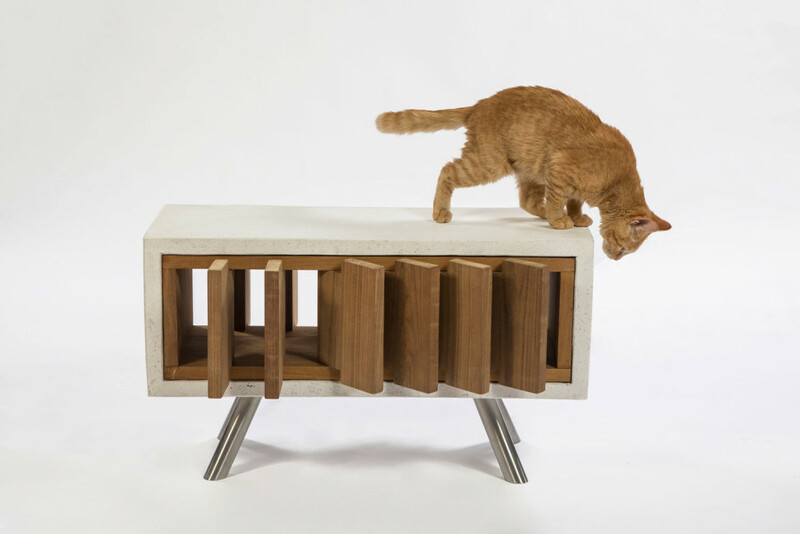 Inspired by the Chinese Yin and Yang symbols and the contrasting energy of the cat and fish, this house also doubles as a side table – a practical solution for domestic cat owners with limited space. 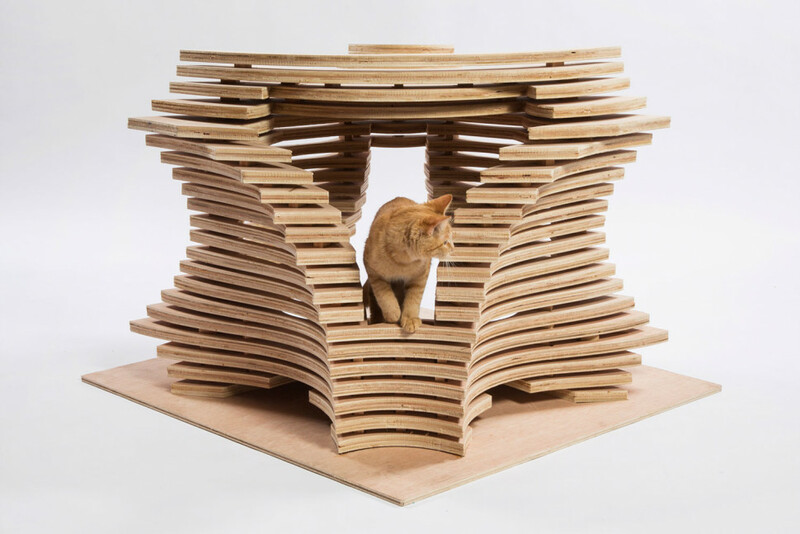 Similar to the Abramson Teiger Architects construction, the CallisonRTKL cat house uses stacked wooden layers to create a star-shaped shelter. 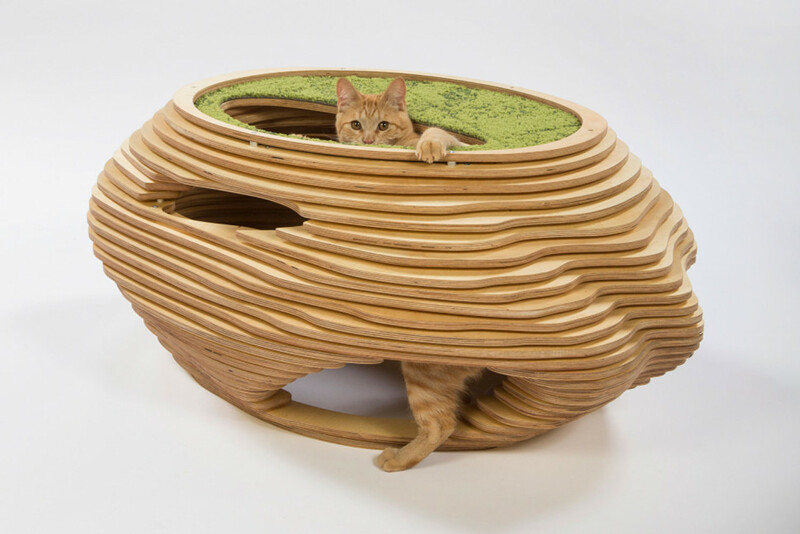 Two large entry and exit points provide easy access to and escape from predators and the playful shape puts a modern spin on the traditional kitty condo. Unfortunately, the spacing between the wooden layers and the size of the access points make this a rather inefficient shelter from the elements. In warmer climates or even a sunroom, however, this “cat Sil-houette” home is a fun addition for any feline. DSH Architecture focused on creating an aesthetically appealing structure, but at the cost of practicality. 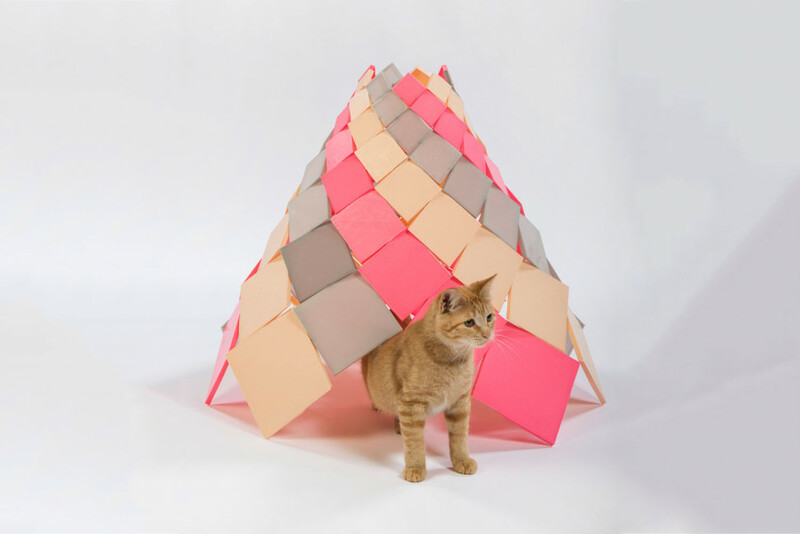 Their “spiral kitty cone” is constructed from glow-in-the-dark 3-D printed tiles. The square tiles come together to create a teepee with entrance and exit points around the bottom of the structure. The large hole in the top of the home and the many spaces between the tiles, though, make this a rather ineffective shelter for any stray. 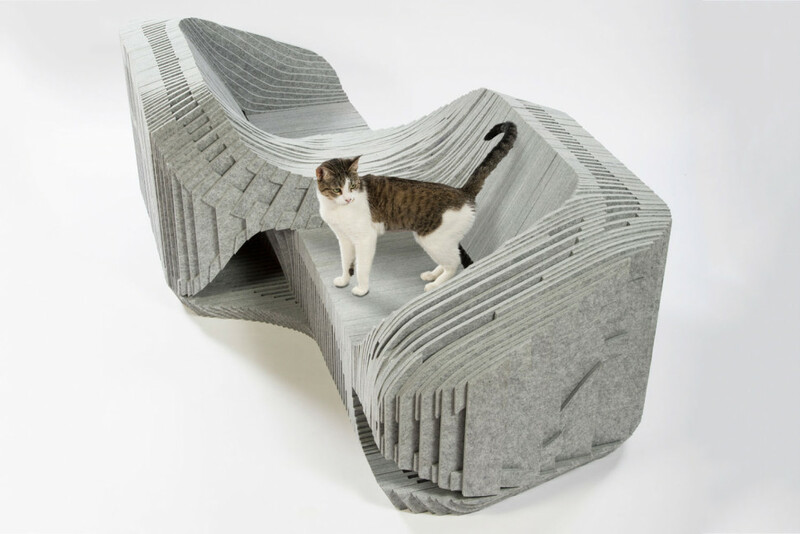 The “Cat-a-Tete” cat house from the Formation Association and Buro Happold is both environmentally friendly and practical. Made from recycled plastic bottles, the home offers seating for two people while providing safety and protection for cat’s underneath. Smaller entry and exit points allow cats to come and go with ease but prevent larger predators from entering and full coverage shelters residents from the elements. The interior, shaped in a figure eight, creates a safe pathway for strays to come and go and the slatted exterior provides minimal sunlight to illuminate the house without overheating. The “catSCAPE” from HOK is far from practical in design, but the modular build is both unique and appealing to the eye. Large openings provide easy access for feline residents to move freely through the structure, but unfortunately, it offers the same to predators. The airy home also doesn’t protect against the elements, but it does prevent overheating and odor. 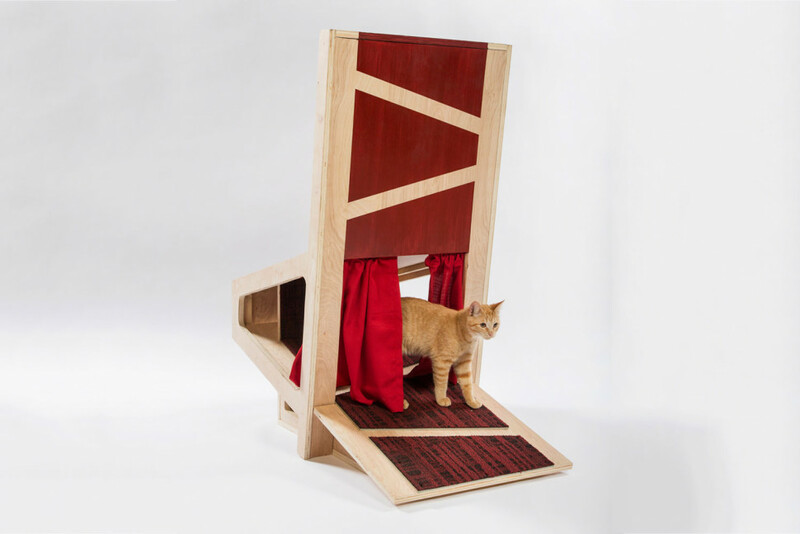 Made from wooden blocks and slats, this is a sturdy abode that is best suited to the domestic cat rather than feral feline community. KnowHow Shop took a space-age approach to their “Lunar Cat Lander” home. The sturdy wooden platform features food and water bowls, a sunning spot, and a roomy shelter. Like many of the homes for this project, the house itself is lacking in terms of protection from the elements and predators. Rather than an outdoor shelter, this piece would make the ideal litter box, hideaway and feeding station for a spoiled housecat in any conservatory or sunroom. 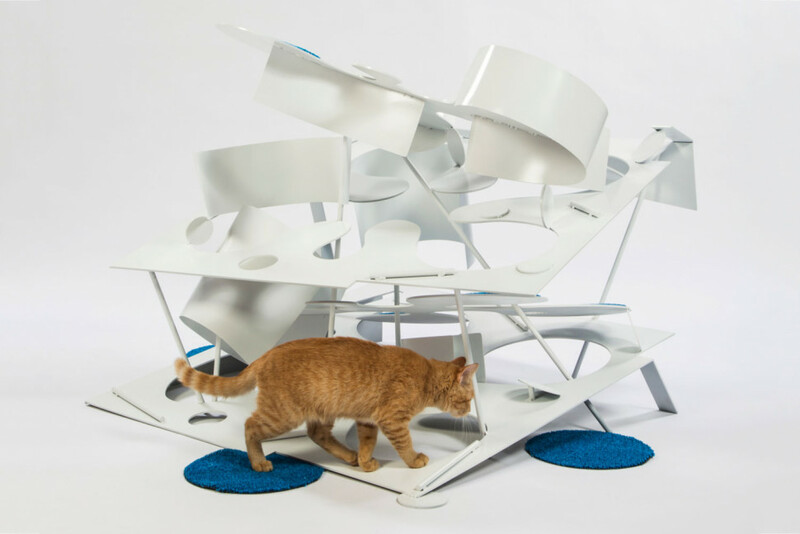 Lehrer Architects kitty condo resembles a modern art and drum set mashup. Ramps, poles, and curvatures provide plenty of stimulation for the senses and platforms offer unlimited sunning potential. 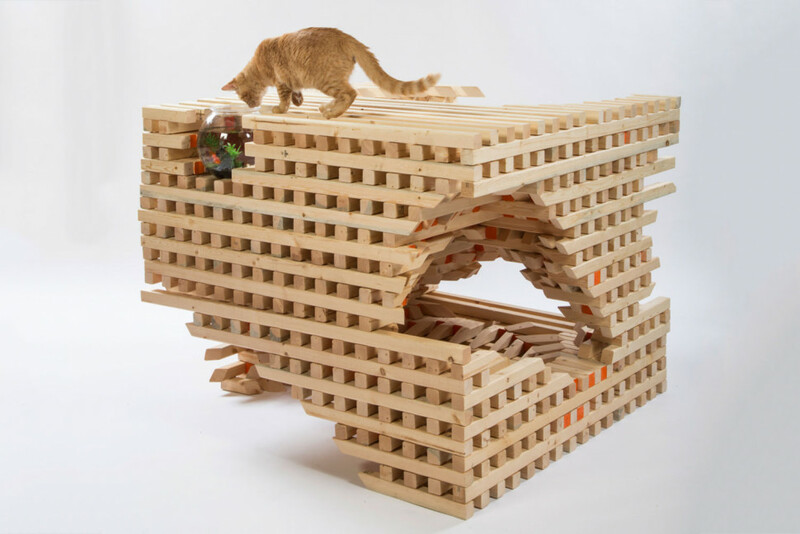 Although certainly unique in design, this piece is more representative of a kitty playground than a shelter of any sort. 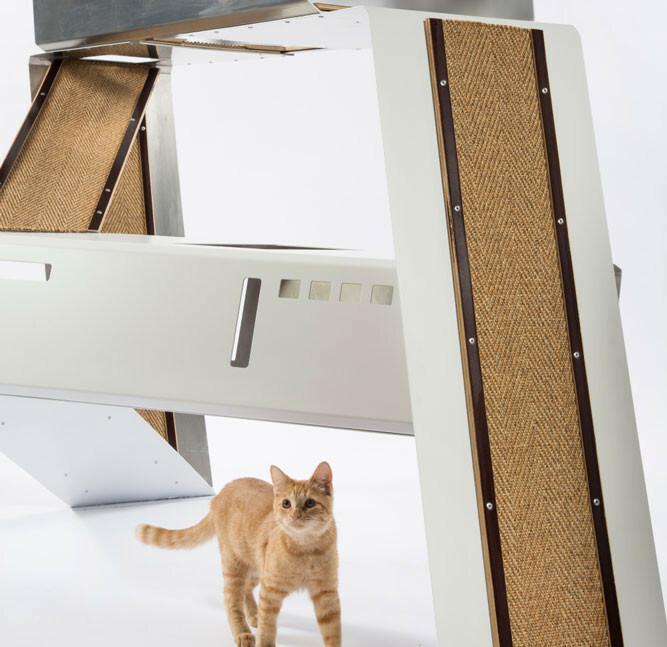 The “Catleidoscope” from Perkins+Will offers security to feline residents while providing human onlookers with visual stimulation. 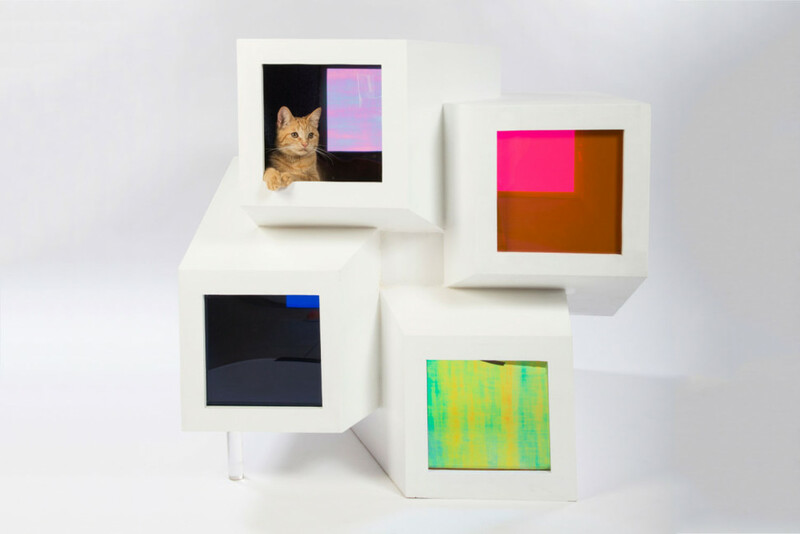 Four brightly colored pods offer “condos” for individual cats as well as protecting them from the elements. Suitable for indoor or outdoor use, this interesting structure could just as easily be featured in any art museum exhibit as it could in an urban area populated by strays. The “Teatro de Gato” from Pfeiffer Partners Architects resembles the theater stage but offers very little in terms of practicality. The fully open structure provides minimal space for sleeping, no protection against elements or predators, and a particularly flimsy “door”. What the kitty theater does offer, however, is a sunning platform and a unique centerpiece for any theater lover with an indoor cat! The aptly named “String Theory” from RNL Design is another piece that offers plenty of interaction for the indoor cat. Bright red string threaded between the platforms offers stimulation as well as visual appeal. The faux grass on interior platforms provides textural appeal and warmth while two exterior platforms allow for sunning. Although completely lacking in protection or shelter, this is a luxury playground for any inquisitive feline. 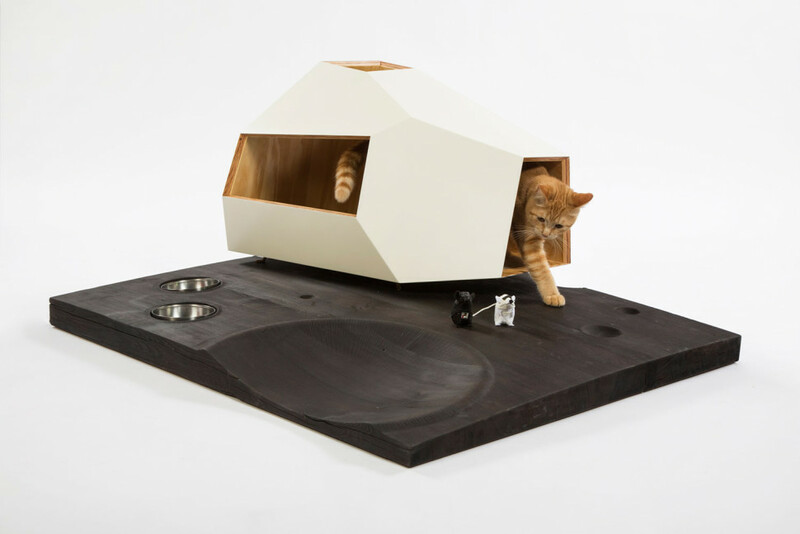 Standard Architecture offered up the “California CatCube” for their submission. A concrete cinderblock-like structure on the exterior provides temperature control while interior teak slats provide ventilation. Quite small in size, this is a one-cat home built to stand up to the elements. Although not an option for cats that don’t care for small spaces, the small entry points offer protection from a wide range of predators. The cat shelter from WORD is perhaps the most unique of all twelve house designs. Focusing on a cat’s love for climbing, fabric covered platforms and tunnels come together in a space-age structure. Minimal protection from the elements and fabric strips don’t make this the ideal outdoor shelter, but do provide an interesting and useful art piece for any home!